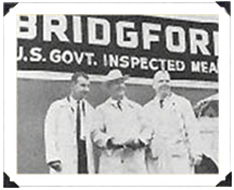 Bridgford Foods is a family-owned business that traces its roots back to the opening of a retail meat market in San Diego, California, in February of 1932. The business has grown steadily since then, and we now offer a diverse line of high-quality products to consumers, hotels, restaurants, and even the United States Military. Bridgford Foods is now proudly headquartered in Anaheim, California – about four miles from Disneyland. In addition to Anaheim, we also have two facilities in Dallas, one in Chicago, and one in Statesville, North Carolina. Presently we employ over 500 people and sell products in all 50 of the United States, as well as Canada and several overseas locations. Ready to Eat Sandwiches were originally developed for the United States Military as combat rations for troops on-the-go. The Military required a sandwich with a three-year shelf-life that tastes as great on day 1,095 as it does on day one! When originally tested by Natick (the division of the U.S. Army, responsible for researching and managing food, clothing, shelters, and support items for soldiers), the product received one of the highest acceptance scores of any new product introduction! Our Ready to Eat Sandwiches were field tested with the United States Marines during an operation in Fallujah, and they are currently incorporated into the US Military “First Strike Ration” MRE, as well as MRE-#30. Bridgford Ready to Eat Sandwiches are produced in our Statesville production facility, under a grant of inspection with the USDA/FSIS. We are also inspected by the USDA/AMS, FDA, NCDA, VETCOM, Silliker and various other agencies. All of the meat and poultry that we use is purchased from USDA facilities and is BSE tested to ensure the product’s safety and quality.